You are snookered on the red. How to escape off one cushion? First, imagine a line drawn from the object (red) ball to the cushion, and perpendicular to it. Now draw a line parallel to that last line. 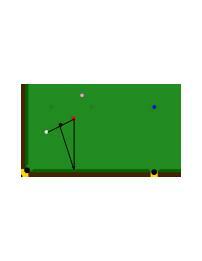 This is the direction you must roll the cue ball. Hit the cue ball softly, in the centre along this line. The cue ball will rebound along the yellow line and you have successfully escaped. Bear in mind that if you hit the cue ball hard, it will not rebound off the cushion properly, but will throw. Similarly, any side on the cue ball, and to a lesser extent and topspin or bottom on the cue ball, will throw it.